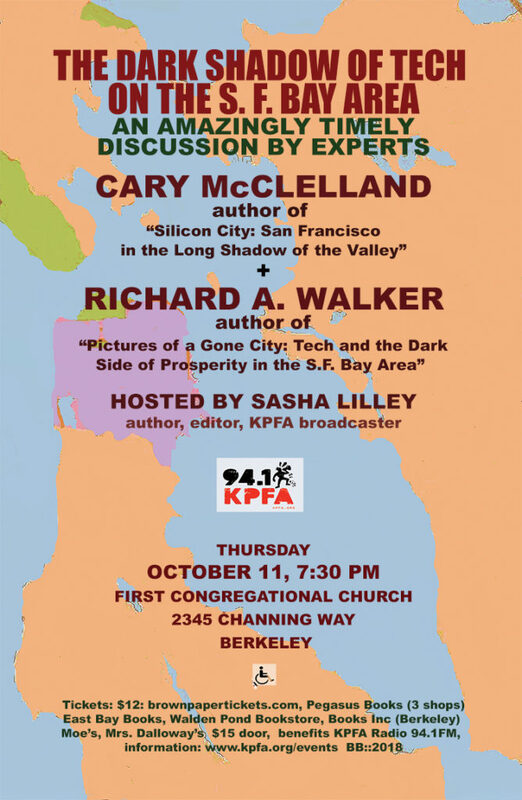 An amazingly timely discussion by experts: Cary McClelland, author of “Silicon City: San Francisco in the Long Shadow of the Valley + Richard A. Walker, author of “Pictures of a Gone city: Tech and The Dark Side of Prosperity in the San Francisco Bay Area." Hosted by Sasha Lilley. 201810117:30 pm 201810117:30 pm America/Los_Angeles “The Dark Shadow of Tech on the S.F. Bay Area” KPFA Radio 94.1FM presents: Thursday, October 11, 2018 – 7:30 PM First Congregational Church, 2345 Channing Way, Berkeley, CA Advance tickets: $12 : brownpapertickets.com :: T: 800-838-3006 or Books Inc (Berkeley), Pegasus Books (3 sites), Moe’s, Walden Pond Bookstore, Mrs. Dalloway’s. East Bay Books $15 door, wheelchair access Cary McClelland is a writer, filmmaker, lawyer, … Continued First Congregational Church, 2345 Channing Way, Berkeley, CA. Cary McClelland is a writer, filmmaker, lawyer, and rights advocate. His book is an eye-opening portrait of San Francisco transformed by the tech boom. Famously home to artists and activists, the birthplace of the Beats, the Black Panthers, and the LGBTQ movement—in recent decades the Bay Area has been reshaped by Silicon Valley, the engine of the new American economy. The richer the region gets, the more unequal and less diverse it becomes. Cracks in the city’s facade—rapid gentrification, an epidemic of evictions, rising crime, atrophied public institutions—have started to appear. Cary McClelland spent several years interviewing people at the epicenter of the recent change, from venture capitalists and coders to politicians and protesters, from native sons and daughters to the city’s newest arrivals. We hear from people who have passed through Apple, Google, eBay, Intel, and the other big tech companies of our time. We meet those who are experiencing changes at the grassroots level: a homeless advocate in Haight-Ashbury, an Oakland rapper, a pawnbroker in the Mission, a man who helped dismantle and rebuild the Bay Bridge, and many fascinating others. Sasha Lilley is a writer and radio broadcaster. She’s the host of KPFA’s critically acclaimed program of radical ideas, Against the Grain, and the series editor of PM Press’ political economy imprint Spectre. Her books include Capital and Its Discontents and Catastrophism:,The Apocalyptic Political Collapse and Rebirth.